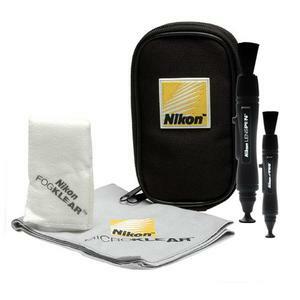 Get your lenses crystal clear with this high-quality cleaning kit. 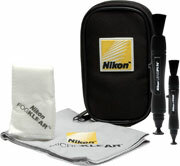 The Nikon LensPen Pro Kit includes everything you need to keep your optics in peak condition. There are two LensPens - the Standard size pen for cleaning larger lens surfaces and the Micro pen for compacts, LCD displays and rangefinders. It has a soft retractable brush and a non-liquid, environmentally friendly compound on a natural chamois tip to remove fingerprints, dust and grit from any lens. A must for maintaining coated lenses. The Nikon Lens Pen Cleaning System is a great accessory for any optics user, it is great for digital or 35mm camera, binoculars, spotting scope. The Dry Anti-Fog Cloth is a reusable cloth that utilizes a breakthrough dry compound that stops condensation from forming on lens surfaces. You will get over 200 applications from this cloth! The Microfiber Cleaning Cloth is anti-static for cleaning the housings of optics equipment and more.